This super telephoto works on both "full frame" cameras as well as the "APS-C" style digital SLR cameras. The aperture is not communicated to the camera body. 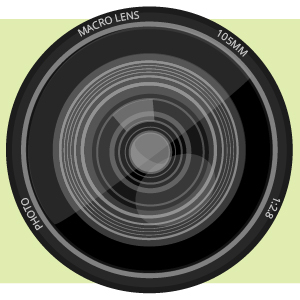 As such, you can use the lens in "M" manual exposure mode or "A" aperture-priority mode only. The Bower T-Mount to Pentax K Mount Adapter allows you to mount T-mount lenses, telescopes, microscopes, and other optics to your Pentax K-mount camera body. When in use, automatic camera functions, such as autofocus and exposure control, will not be available and must be set manually. Box Dimensions (LxWxH) 14.6 x 3.5 x 3.4"
Box Dimensions (LxWxH) 2.8 x 2.7 x 0.9"
500mm f/8 Manual Focus Telephoto T-Mount Lens is rated 4.2 out of 5 by 38. Rated 4 out of 5 by Hayes from Great lens for a great price! I use this lens on my Canon 70D for nature and wildlife shots and I love it! Sure, it is a T mount, so there is no autofocus, image stabilization, or in camera aperture control, but due to the price and optical quality of this lens that is irrelevant. It also gives you a greater sense of pride in your work because you were the one that got that great shot, not your fancy lens. Anyways, once you get the focus right the clarity of the photos is astounding for the price of the lens! There is also very little aberration and color fringing, and no vignetting. For the more advanced photographer, or even a beginner, I highly recommend this lens! Rated 4 out of 5 by caleb J. from Great for the price. I bought this lens for bird photography. I was thinking of dropping a grand for the sigma 50-500 but ended up just sticking with this since I wasn't sure if I was something that I would really get into. After getting this lens I didn't expect a whole lot out of it and I didn't get a whole lot. But I got what I paid for and the optics are very sharp. It has a pretty strong construction with an exception to the mount. I have noticed a fair amount of coma when shooting at f/8 but that was to be expected. I generally just bump my iso up to 800, shoot at 1/500th of a second and f/11 isn't so bad from there. Rated 5 out of 5 by Astronut from excellent for wildlife I find this lens to be a good wieght, it is easy to point at the moon or birds. It has an easy and accessable focus ring. As an added bonus with this lens you can adjust the apature. It uses a 67mm filter which I acquired through a local business, not B&H .... I also use this lens for stellar pics, pressently there has been light cloud cover, but even still I have acquired some amazing pictures of the moon. This lens is excellent. I did remove the mounting ring, as the lens is not too heavy and I preffer to mount my camera body onto a small tripod for still, or low light pictures. This lens has also captured wild close up images of vultures feeding on a carcus :). Rated 5 out of 5 by Tim from Colorado from For this price you get a nice lens For this price, 5 stars. A very nice, surprisingly well made and solid lens that will take me some time to learn how to master a long manual focus lens in the field. Not too heavy for a long lens attached to a D90, but I have been using my left hand to hold this 500mm lens while taking pictures of hawks jumping off of branches. I did hope that this lens would be a little sharper at longer ranges, but again, for this price, hard to complain. The included mount is not ideal as it can start to come lose while adjusting focus. I could not tighten it enough to prevent it coming lose again. Rated 5 out of 5 by Natureshooter from The Right Tool in the Right Place Considering how inexpensive this lens is it performs very well. As a nature photographer, it gives me a distinct, and light weight, advantage of getting still images of wildlife that nearly fill the frame - without the subject's awareness of my presence. Definitely a good addition to your existing lenses! Keep in mind that it is manual focus and that because of its focal length you require a tripod and a remote (or cable) release for blur free images. Rated 4 out of 5 by gator7k from It takes a bit of patience I use this lens on a Sony a330 DSLR , for wildlife,birds ,and landscapes . It is built well . I like the metal construction .I think its a great value for the money . I dont like it being f/8 . It can produce good photos , if you have the patience , as it is manual focus , and getting the right shutter speed takes time . I have been able to get a clear photo at 50 yard and can count the needles on a branch of a pine tree . A sturdy tripod is a must have . I have a cheap one and a breeze will make camera shake . Rated 3 out of 5 by barefoot from Very decent lens, after modification. This lens can produce great images, you just have to understand there is no communication with the camera. This means you put your camera on manual, guess at shutter speeds, and adjust them after looking at the picture. I've found I have a pretty good feel for exposure now, so I usually get it close on the first try. I also bracket exposure, so I'm sure to get a properly exposed image. This, coupled with the manual focus, means it might be tough to use for action shots, but for wildlife, it's not so much of a problem. The picture quality is very good though, so it's worth the inconvenience, especially when you look at the price of everything else in this focal length. There is a major problem though; I ended up correcting it myself, but some people may not be able to do what I did. On my Nikon D70 it wouldn't focus on infinity. You could turn the focus ring all the way, and it just wasn't enough. I ended up sending the first lens back for an exchange, but when the second one exhibited the same problem I had to figure out what was going on. The problem is the lens is too long with the Nikon T-mount adapter. I can't say if other mounts would have the same problem, but I would say any prospective customer should keep this in mind. I fixed it by gradually grinding off material on the end of the lens tube, until it was the right length. Problem solved, but admittedly, an extreme measure. In conclusion, for me the lens was a great purchase, which has produced many fine, very sharp images (and I'm a pretty harsh critic of lenses), all for less than the cost of a tele-extender. If you can deal with these issues, I think you would be very pleased with the pictures you can take with this lens. Rating on picture quality alone, I'd have given it 5 stars. i have nikon d3200. this lense is suitable for my camera? and only buy this lense or other adapters for use? You need a nikon adapter and there will be no auto focus but you should be able to get clear pictures in good light. Is this the same lens as the 500/8.0 Vivitar that looks the same in your web catalog photos? Yes, the lenses are essentially the same and have the same design; they simply have different branding. Will this fit a Sony NEX 6 E mount camera?. You will need a T mount to E mount adapter in order to attach. 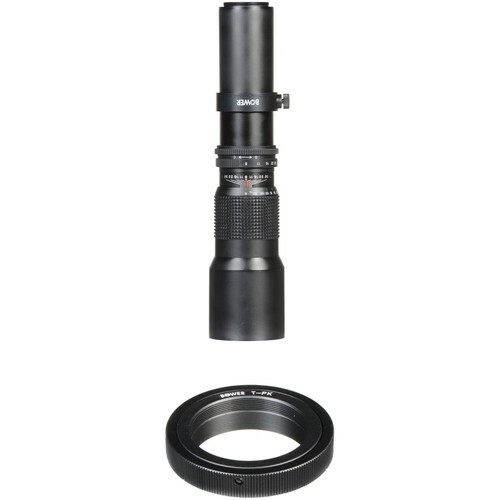 You would need a T-mount adapter to connect the Bower 500mm f/8 Manual Focus Telephoto T-Mount Lens to your Canon EOS DSLR camera. The Vello Lens Mount Adapter - T Mount Lens to Canon EOS Camera, B&amp;H # VELACEFT, would work for your needs. Is this actually the same lens from the same factory as the 500mm/8.0 telephoto that looks the same in the Web pictures? While we cannot guarantee what factory the item is produced and shipped out of, and if it will be the same factory as the one pictured, we guarantee that it will be from a Bower factory, which manufacturers items to Bower's company-wide specifications and quality controls. Will this lens fit a Canon EOS Rebel T3? I want to find a bigger lens for my camera and I am not sure if this will work.